Bet Browns +6 over Ravens with 888sport. Bet Colts -3.5 over Titans with Karamba. Bet Seahawks -13 over Cardinals with Betfair. Bet Jets +13.5 over Patriots with 888Sport. You’ll read a ton of trends about the Browns this week and how much they’ve struggled in Baltimore (dropped 14 of last 17 meetings overall) but this is a different team. The Browns are no longer the doormat in the AFC North. This team has won five of six, is playing with a ton of confidence and is loving head coach Gregg Williams right now. Williams is a defensive guru and he should be able to throw some curveballs at Lamar Jackson, who has mostly been allowed to be a run-first quarterback over the last six weeks. However, it’s worth noting who the Ravens have played: Cincy, Oakland, Atlanta, Kansas City, Tampa Bay and the Los Angeles Chargers. All of those teams’ defenses allow at least 4.4 yards per carry. The Chargers are ranked 13th in that category while everyone else is 22nd or lower. Cleveland had struggled with this early in the season but is allowing just 3.3 yards per carry over their last three games. The Ravens need to win this game to secure a playoff berth but the Browns are looking to finish with a winning record. Take the Browns to beat the +6 point spread on 888sport. As we move further along in the week, I’m liking the Colts more and more. Originally, they were laying under a field goal on the road but now that it looks like Marcus Mariota is not quite right and will either be out or severely limited, I like Indy even more. Tennessee has mostly been a one-trick pony this season as they are effective when they run and weak when they don’t. Well now the Colts defense will be able to stack the box and make sure Derrick Henry and Dion Lewis can’t get going. Henry has averaged 6.1 yards per carry in his career against Indy but this is probably the best Colts defense he’s seen. 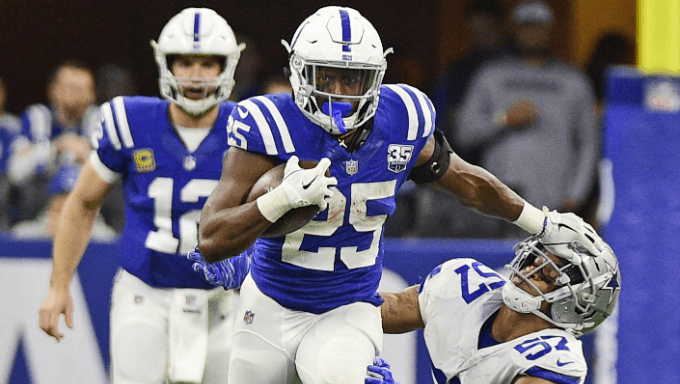 The Colts are eighth in rushing yards per game allowed at 102.2 and have allowed even less (94.7) over their last three. On offense, the Colts are red-hot right now having won eight of nine. It will be tough sledding against the Titans on the road but the Titans will be without Pro Bowler Jurrell Casey, and that should make things a bit easier for the Colts. Bet the Colts to win and to cover that -3.5 point line at Karamba. The Seahawks are facing a huge number on the spread this week but it’s a line they should be able to cover. The Cardinals have lost the last three weeks by at least 14 points each time, with two of the games coming at home. On the road in Seattle is not a place where I expect them to figure things out. The Cardinals passing game has been abysmal as Josh Rosen had just 87 passing yards last week. That now makes five of the last six games that he’s been under 150 passing yards. This team can’t run the ball very well either as they are dead-last in that category with a league-low 3.8 yards per carry. Seattle still needs this game to avoid a road trip to Chicago in the first round, so look for them to fight in this game. All it should really take from them is pounding away on the ground and avoiding turnovers, which is something they’ve been great at while winning five of their last six. That desperation to avoid Khalil Mack and the Bears should power the Seahawks to cover the -13 point line, so hammer it on Betfair. The Patriots are laying a huge number here but part of it feels because we’re paying for the brand. This is a team that had a tough time winning by 12 last week at home to Buffalo and has won by more than two touchdowns at home just once this season. Something is not quite right with this offense as Tom Brady had just 126 passing yards last week, Rob Gronkowski has looked old and slow, and Josh Gordon is out of the picture. The Jets have lost eight of nine but they nearly beat Houston two weeks ago and should have beat Green Bay last week. They’re fighting.